Download to learn how Uponor tackled these challenges by leveraging The Sitecore® Experience Platform™ and using the Sitecore’s Customer Experience Maturity Model to create a custom marketing roadmap plan that creates extraordinary customer experiences. • What are key steps to consider when adopting customer-centric business objectives? 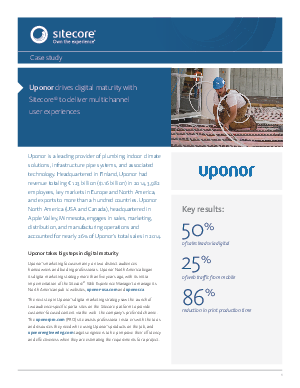 • In what ways has Sitecore been a sustainable platform for Uponor’s digital growth? • What methods can you use to develop your organization's digital vision?